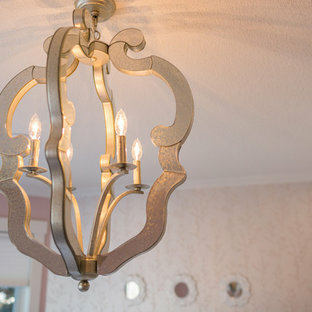 Lighting purchased and installed by Bridget's Room. 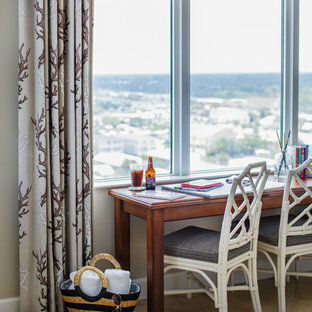 This playroom designed by Tailored Living is custom fit to go wall to wall and around the window dimensions. 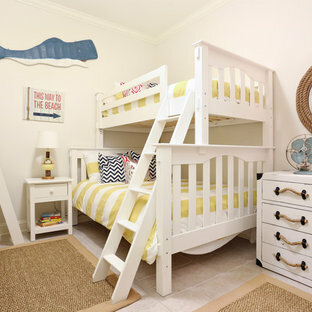 It features a cushioned seating area and plenty of storage space in cabinets and pull-out drawers for books and toys. The design is a clean and crisp white bead-board with crown molding. The open bookshelves are custom hole bored for a cleaner look and the closed cabinets have hole boring for adjustability of shelving to fit different sized items. The system is finished off with matching curtains, cushions and pillows. With a backdrop of white, gray and black an oversized playroom wall is zoned into three functional spaces to showcase family photos and precious artwork while adding handy wall hooks and playful magnet boards at the perfect height for little ones. Shown in this photo: gallery wall, shiplap, gooseneck lighting, floating shelves, magnet board, playroom, accessories & finishing touches designed by LMOH Interiors. | Photography Joshua Caldwell. 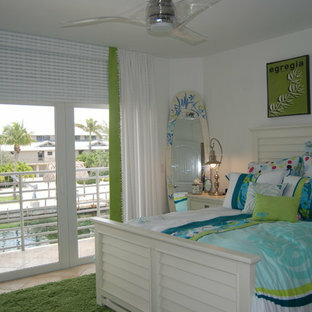 The girls bedroom has a surfer beach like theme in white, lime green, and aqua. The lime green shag area rug provides a soft feel and lots of texture to make the white furniture pop. The surf board mirror makes for lots of fun along with the surfer bedding that gives the feeling of waves. A young family from Canada, a couple with two children, occupy this Jupiter home on long weekends and vacations. Since the husband is an avid golfer, a key decision in purchasing this home was proximity to local golf courses. Throughout, the 3000 square feet of living space and 1000 square feet of terraces, the idea was to keep the design simple with an emphasis on transitional style. The couple is partial to a combined British West Indies and Restoration Hardware aesthetic. 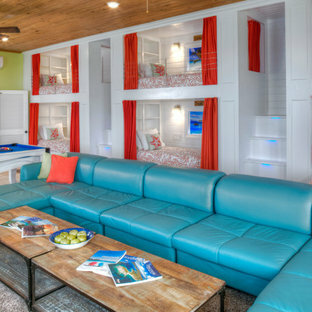 The color palette for each room was selected to flow easily throughout. Photo by Taylor Architectural Photography. Designed under previous position as Residential Studio Director and Project Architect at LS3P ASSOCIATES LTD.
Wall Covering purchased and installed by Bridget's Room.